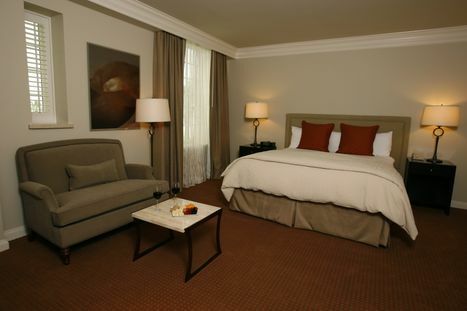 Hotel Galvez & Spa, A Wyndham Grand Hotel, has unveiled its beautifully appointed new second floor guest rooms. In preparation for the hotel’s 100th anniversary in 2011, hotel owners George Mitchell and the Mitchell family are updating all guest rooms with a new décor. Second floor rooms now feature a soothing neutral palette, plush carpeting by Constantine, Atlas and Masland, Bernhardt fine furniture, Simmons® HealthSmart™ mattresses, 37-inch Samsung flat screen televisions, Stacy Garcia duvet covers, custom headboards, new window treatments and updated lighting. As part of the new décor, all rooms feature nature-inspired aluminum prints by Kayla Mitchell, granddaughter of George Mitchell. The hotel is also replacing its Gulf facing windows with new divided light windows reminiscent of the hotel’s original design. Last year, the sixth floor rooms were converted to spa-inspired rooms featuring rain showers, Simmons HealthSmart mattresses, Anichini bedding manufactured in Italy, 42-inch flat screen televisions and luxurious amenities including spa robe and slippers, books and iPod® iHome players. These sixth floor features allergen-friendly Wyndham ClearAir sm rooms, which have undergone a multistep cleaning process designed to remove up to 98 percent of allergens using medical-grade air purification systems designed by New York-based Pure Solutions NA. Suites on the seventh and eighth floors were updated last year with new décor and furniture, including the addition of plantation shutters. Suite windows are being converted to custom divided light windows. Throughout the year, the hotel also will renovate its third, fourth and fifth floors in time for the anniversary in 2011. Hotel Galvez will launch a year-long celebration commemorating its 100 years of operation with a New Year’s Eve Ball on Dec. 31, 2010. Monthly events include unveiling a new Hall of History, a group wedding vow renewal event, a bathing beauty revue and classic movie shown on the hotel’s lawn. During the centennial anniversary weekend in June, the hotel plans to host a day of concerts on the lawn followed by a fireworks display over the Gulf of Mexico. The hotel will commemorate the birthday of the hotel’s namesake, Bernardo de Gálvez, on July 23 with a Spanish-themed wine dinner. Events will continue throughout the fall. A full calendar of events will be posted at www.hotelgalvez100.com. When Hotel Galvez opened in 1911, Galveston had just finished building its 17-foot Seawall to protect the Island from storm surges, and its grade raising project which raised the grade of land as well as hundreds of buildings from 11 to 14 feet to make them less susceptible to flooding in the event of future storms. The Causeway had been completed, now connecting Galveston Island to the mainland. All of these accomplishments were part of the Island’s recovery following the Great Storm of 1900. Hotel Galvez, A Wyndham® Grand Hotel and a National Trust Historic Hotel of America, remains the only historic beachfront hotel in Galveston and is rated four diamonds by AAA and is part of Mitchell Historic Properties. Wyndham Hotels and Resorts, LLC and its affiliates, subsidiaries of Wyndham Worldwide Corporation (NYSE: WYN), offer upscale hotel and resort accommodations throughout the United States, Europe, Canada, Mexico, China and the Caribbean. All Wyndham hotels are either franchised or managed by the company or managed through a joint-venture partner. Hotel Galvez & Spa renovated all its guest rooms in conjunction with its centennial celebration. All rooms offer a warm, modern feel in contrast to the historic ambiance of the hotel's public areas.